Brown Trout are originally from Europe but have been transplanted to a number of other places. Brown Trout are less plentiful and tougher to catch than their cousins the Rainbow Trout. Many of the same techniques that work for Rainbows will work for Browns. They often live in the same places and eat the same things. Bigger Browns tend to predate more on fish, including small Rainbows and other Browns. Browns can exceed 40lbs but fish anywhere near that size are extremely rare. Anything over 4lbs is a nice fish in my mind. Browns live in cooler water rivers and lakes and in some places like Chile and Argentina even run out to the ocean. One of the big pluses of fishing for Browns, and trout in general, is the beautiful places where they live. Brown Trout develop sharp teeth as they get bigger, so be careful when handling them. They are probably good to eat but I have released all the ones I have caught. A light action spinning rod will handle most Browns. Like most trout, they have good eyesight so use the lightest line you can get away with. Monofilament line is often a better option than braid in many cases as they have fairly soft mouths and the stretch of mono results in less pulled hooks. Although the larger ones have teeth you cannot use wire or heavy leader or you will not get any bites. You just have to hope they do not get the line in their teeth. That is another reason it is better to fish for big Browns with lures. When fishing in rivers, try to fish behind boulders and other structure. The fish hide behind these structures in faster water and pounce on things that float by. In slower current, they spread out more when feeding. When resting they will find places to hide to avoid expending unnecessary energy. Pretty similar to most fish in rivers. In lakes they can be trickier to find; seek local knowledge for the time of year at the locale where you are fishing. Brown Trout will eat spinners and spoons, but the big ones are often caught with minnow plugs and jerkbaits like Countdown Rapalas and Husky Jerks in the color of the local forage. If you don't know what that is, you can usually be safe using a Brown Trout color pattern since they love eating their own young and wherever there are big Browns there have to be little ones. Patterns that mimic baby Rainbow trout often work well also. Flies are also very effective, especially larger patterns like streamers. Also, marabou jigs can be deadly in the right conditions. I'm not a big fan of fishing for Brown Trout with baits because they are more likely to get gut hooked and die and also they are more likely to bite through the line with their sharp teeth. You can't use heavy leaders most of the time because then they won't bite. Nightcrawlers will generally work if you want to use bait. 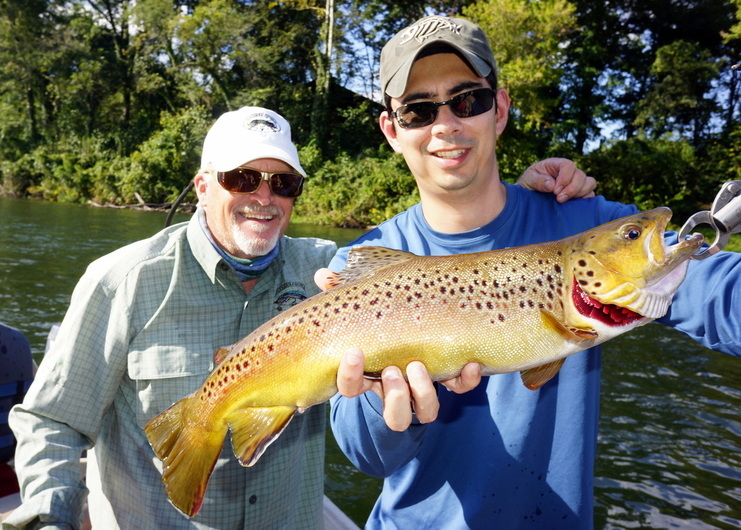 The best overall fishery for Brown Trout that I know of in the US is the White River in Arkansas. The record is a 40+lber but most are much, much smaller than that. The browns are wily and tend not to feed when there are lots of people around, which is often on this popular river. Anything over 4lbs is a nice fish here. The White is very scenic and a pleasure to fish. 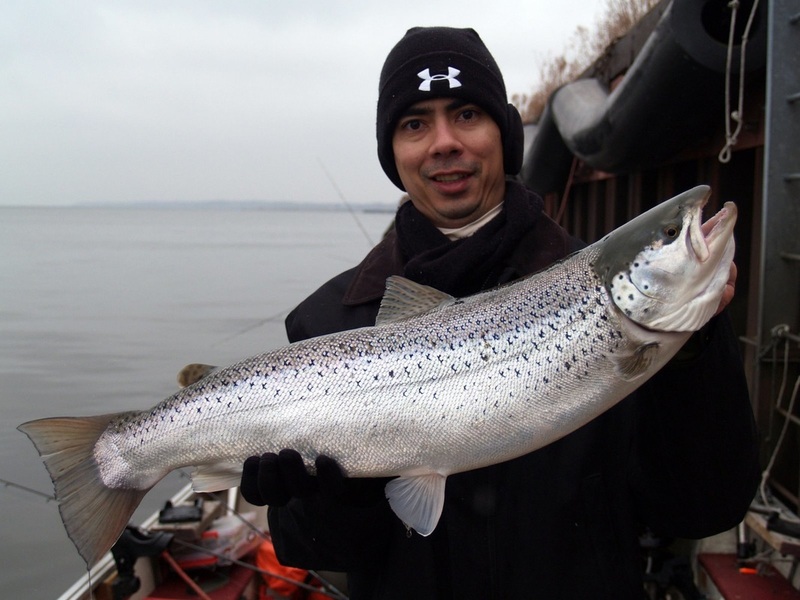 The best trophy Brown Trout fishery that I know of is in Milwaukee Harbor during the winter. The harbor is kept unnaturally warm, so fish from Lake Michigan tend to congregate near the warm water flows inside the harbor. I went one time with a guide and had great success using Gulp Jerkshads fished slowly on a leadhead. However, this is probably the least picturesque place I have ever fished. Downtown Milwaukee was literally 50 yards away and all kinds of trash including a used condom were floating by. However, the fish were really stacked in there and they were huge. My biggest was around 8lbs but I caught several over 5lbs in just a few hours fishing and my guide caught a couple in the double digit range. I was hampered by the fact that I was colder than I have ever been in my entire life. Despite having bundled up after a few hours I could not feel my legs below the knee and had to constantly look down when walking to see where my feet were so I wouldn’t trip since I couldn't feel it when they touched the ground. I couldn’t fish well with gloves so my hands were pretty numb which made fishing tough. It was literally a week before I felt warm again after that. The owner Chris is an excellent guide and they also have rental boats if you want to do it on your own. Brown Trout caught near Milwaukee, Wisconsin in February. They can be caught in the cold if you are willing to be out there. Note the completely different color pattern. Brown Trout caught on the White River. They often bite in the dark, unlike Rainbows. Another White River Brown Trout caught on a jig.